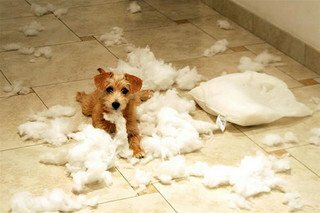 Dog Chewing - Save Your Couch! Dog chewing is a problem that often shows up shortly after bringing home a new puppy or an adult dog, and trying to stop it can be challenging. Puppies start chewing to relieve their "teething". Unfortunately, this often turns into a habit, and when left uncorrected can turn into quite a problem. I'm not kidding! I have seen dogs chew shoes, socks, underwear, leather purses, TV remotes, telephones, chair legs, pillows, couches, and even drywall and doors! If you have a new puppy, there are things you can do to prevent his teething from turning into a huge dog chewing problem. Making sure your pup has a few good chew toys from the start to be sure that he has something to help pop his new teeth through. ... crate train. I know, I know - many of you are horrified at the thought. Please try to stick with me here for a minute while I explain myself. Crate Training is the Best Prevention! Used properly, a crate is a safe place that your dog will enjoy spending time in. It should never be used as a way to discipline a dog. Why? Dogs don't understand time-out - correction needs to be in the moment, no less than 1.5 seconds after the bad behavior occurs. Let's say you find your puppy chewing something he shouldn't be. By the time you drag him over to the crate and get him in there for his "time-out", he has no idea what it's all about. Yes, your dog knows you're angry. But he will not put that together with whatever he did wrong before you forced him in the crate. He will simply associate going in the crate with you being angry - and therefore will begin to hate his crate. See how that's a problem? 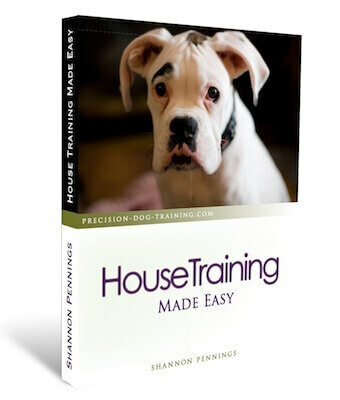 Take at least a week to slowly and properly crate train your dog or puppy. Always make it enjoyable for the dog - give him a treat for going in, leave favorite toys with him in the crate, and put a comfy bed or blanket inside. 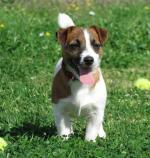 Especially with a puppy, be sure to walk him and let him pee or poop before crating. Learn the proper way of crate training a dog or puppy. OK. So let's get more into why crate training is good for preventing dog chewing. Obviously, if a dog or puppy is in their crate, he can't get at objects that he shouldn't be chewing. If you can prevent inappropriate chewing, you can prevent it from becoming a habit. So whenever you aren't able to keep both eyes on your dog, or you have to leave the house, crate him. If you can't watch the dog while you're cooking dinner, you should crate him for that time. Throw in a chew toy and put your dog in his "play pen" where he'll be safe and away from any tempting shoes. I recommend buying a sturdy plastic Vari-kennel over a wire crate. Dogs seem to like these kennels better, as it is more of a "den". If you do have a wire crate, you can cover the crate with a blanket to make it cozier for your dog. The kennel should also have a squeeze lock on the door, as opposed to a spin-dial. It's hard to believe, but some dogs can figure out how to open the dial locks and get out! Remember to get the proper size, too - your dog should have room to stand up, turn around, and lie down. That's it. Any more room, and he will pee or poop in one corner and sleep in the other. Dogs don't like to lay in their feces or urine, so having a fitted crate will prevent this. Let's take a look in your dog's toy box. If you have a dog chewing problem, it's often safe to say that you're giving him toys that aren't the best choice! A puppy is much like a baby in that they put everything in their mouth. It's a way for them to experience new things. When your puppy is allowed to chew a stuffed fabric toy, he will think that anything that feels the same way in his mouth is fair game. What feels like a fabric chew toy? Socks, running shoes, underwear... you get the idea. The same goes for pig ears - in a dog's mouth, they have a leathery feel to them. That's right, it feels the same as your leather purse, shoes, and couch! So what are the best dog chew toys? A general rule of thumb is to stick with rubber toys or real bones. My dog, Justice, has a kong, a couple of Nylabones, a marrow bone, and a small antler. Kongs are great as you can put a treat or a small amount of peanut butter inside, and because of its shape, it has a fun bounce to it that dogs love. While prevention will go a long way to helping with inappropriate chewing, you need to also be catching your dog in the act with a correction while they're chewing in order to solve this dog behavior problem. So what is the best ways to do this? Keep your eyes peeled. When you notice your puppy or older dog chewing something he shouldn't be, give a loud, sharp, "Eh!" sound to startle him. Don't say "no" - this means nothing to a dog. You can also try using a training shaker. Keep an empty pop can with a few pennies in it, and put some tape over the opening. Hold it behind your back and shake it when you catch the dog chewing. Don't let him see the shaker otherwise he'll only avoid chewing when he sees that shaker around! If neither of these are very effective, another good tool to use is a small boat air horn. You can buy one at Walmart, and it should be small enough to fit in your palm. Again, hold it behind your back, and when you catch your dog chewing something he shouldn't be, press and hold the button for 2 seconds. Remember, you need to correct no later than 1.5 seconds after the behavior for it to be effective! Another solution is to teach the dog a command for him to drop whatever is in his mouth. This is especially helpful if dog chewing isn't necessarily the problem, but he just seems to enjoy stealing objects for the joy of having you chase him! Keep a dog training collar on Rover in the house whenever you are home to supervise. 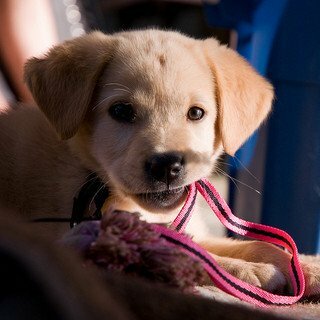 Attach a leash or light rope to the collar, and keep it on at all times during the training period. This can be for one week, or for a month, depending on how long it takes. Choose a command that is short - preferably one word. I use the command "Out", but you can use any word you like, such as "Drop" or "Give". Just be consistent and have the whole family always use the same word so that you don't confuse your dog. As dogs like to pick things up and then run with them, it's easiest to set up scenarios to train this command rather than chasing him around when it happens. So first get your dog interested in a toy, and let him pick it up. You should have a leash and collar on him at this point. Next, give the command to drop the object - "Out" - in a firm but even tone of voice (don't shout). Wait 3 seconds; you want to give your dog the chance to follow through before you correct him. If the object is still in his mouth after 3 seconds, loosen the leash for a split second, pop up vertically fast and firm, and then loosen the leash again. If the dog continues to hang onto the toy, repeat the correction by popping up vertically again fast and a bit firmer. But please, don't repeat the command! You want him to listen to you the first time you give a command, not the second or third time (which is what will happen if you start repeating commands for him). As soon as your dog drops the toy, praise him verbally and physically, but don't let him grab the toy again. If he tries to pick up the toy after your praise, repeat the same correction without repeating the command. He needs to learn that once you tell him to drop something, he can't pick it up again until you say so! Wait at least 10 seconds, and then you can give him a release command ("OK") and encourage him to pick up the toy again. Practice this a few times a day - your goal is for the dog to spit out whatever is in his mouth immediately, the first time you tell him to. And keep a collar and leash on in the house for a few weeks. That way, when your rambunctious pup tries to take off with your shoe, you can grab the leash that is trailing on the ground and tell him to "Out". Remember, always give him 3 seconds to follow through before giving a correction - you still need to be fair! Many people will tell you to trade your dog for the toy by giving him a treat. This is NOT obedience, this is a bribe! And what are you going to do if you don't have a treat on hand? Also, don't try grabbing it out of your dog's mouth - it will turn into a power struggle. Prevent unwanted chewing by crating your dog or puppy when you leave home or can't keep both eyes on him (including at night). Only give your dog rubber toys and chews or bones - things like kongs, Nylabones, and antlers. Give a verbal "Eh!" when you catch the dog in the act of chewing, or use a training shaker or small boat air horn. Leave the leash and collar on in the house for a few weeks after teaching your dog or puppy this "Out" command to catch him in the act of stealing objects or chewing.